For much of its recent history, Colombia often has made the headlines but rarely for the right reasons. Social inequality, drugs, violence and civil conflict almost crippled the country, and 20 years ago Colombia was teetering on the edge of becoming a failed state. Much has changed in recent years. The government of Álvaro Uribe prioritized bringing security to the country, while that of current president Juan Manuel Santos has made peace the centerpiece of his second four-year term. Underpinning both administrations’ major goals, however, have been active government initiatives to take advantage of the opportunities offered by the mobile channel and other digital payments to further an agenda of reducing poverty and social inequality. Colombia’s commitment to the digitization of payments was highlighted this week when the Government of Colombia announced that the whole government was joining the Better Than Cash Alliance, a United Nations Capital Development Fund program dedicated to assisting countries transition away from the use of cash and into digital payments. The entire government’s commitment follows the lead of the Department of Social Prosperity, which has spearheaded a number of major social welfare programs. In particular, the Conditional Cash Transfer initiative Más Famílias en Acción, has played a significant role in almost 2 million Colombians becoming active users of a mobile wallet offered by Davivienda, a local bank. Partnership between the government and the private sector has played a major role in making Davivienda’s mobile wallet, Daviplata, one of the most widely used in the world, though it is rarely mentioned in the same bracket as the mobile wallets pioneered by MNOs in Africa and Asia. Launched in April 2011, Daviplata offers a suite of services that includes P2P transfers (to other Daviplata wallets, or regular Davivienda bank accounts), bill payments, mobile top-ups, and cardless ATM withdrawals. The key to the wallets success, however, has been the willingness of the Colombian government to place Más Famílias en Acción and other social program payments into a mobile wallet, and to create an enabling regulatory environment to facilitate the opening of accounts. The result is that 30% of recipients of Conditional Cash Transfer recipients receive their money in a Daviplata wallet, while the remainder continues to collect it over the counter at the state-run Banco Agrario. Pragmatism and a willingness to experiment have been the hallmarks of the Colombian government’s approach to promoting the digitization of its payment system. A national program, Banca de las Opportunidades, was established in 2006 to promote financial inclusion and to co-ordinate public and private sector stakeholders. There is no explicit commitment to the use of the mobile channel, and where other means of digitizing the economy have presented themselves, the government has grasped them. Examples highlighted in two recent Better Than Cash case studies include the transformation of the national coffee growers federation membership card into a payment card for receipt of harvest payments and subsidies, and the development of an online payment portal directly connected to bank accounts that bypassed Colombians’ lack of access to and trust in using credit and debit cards for online payments. In the case of Más Famílias en Accíon, however, the government recognized that the program could provide a powerful incentive to bring the financially excluded into the formal financial sector, via a mobile wallet. The government worked with Davivienda to make account opening as easy as possible, and crucially lowered KYC standards for access to basic account types. 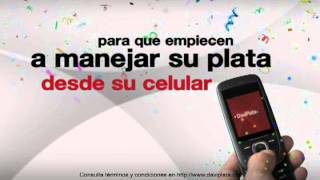 This meant that a Daviplata account could by opened from any SIM card in Colombia, without the need to visit a bank branch. The information inputted during the application process is checked against the national identity card database to which the banking industry has access. Once it has been verified that the information matches that on an individual’s national ID card, further checks against electronic databases are carried out to ensure that there are no suspicions about the person’s true identity or motives. Once passed, the account is opened. Daviplata is also being used for other forms of bulk payment, particularly salaries. 80 thousand military salaries are paid into Daviplata accounts by the government each month, though this is less than a quarter of the number of private sector workers who now get paid into their mobile wallet. Davivienda in also working with merchants to create a network of payment points, particularly in smaller municipalities, at which payments can be made through the Daviplata wallet, in an attempt to recycle funds within the system, and also to expand the utility of the wallet into areas that lack a bank or ATM presence. While the growth of Daviplata’s wallet, backed by government willingness to push payments into the digital age, is impressive, it is clear that Davivienda’s success has not solved the “dump-and-pull” dilemma, as highlighted in a Mondato Insight last summer. Indeed, while praising the progress made by Colombia in moving towards a “cash-lite society”, Better Than Cash noted that the area in which the least progress has been made is consumer purchases. Problems identified include lack of incentives for all major stakeholders – banks, merchants and consumers – to shift away from making consumer purchases with anything other than cash: 90% of the 828 million monthly payments made in Colombia are still made using King Cash. Despite the persistence of the ‘old enemy’, the progress made by the Colombian government and Davivienda is significant, and represents a model that holds many lessons for other countries. Mobile wallets, even highly successful ones, cannot exist in a vacuum. The Government of Colombia has taken notable measures to facilitate the growth of the mobile wallet as part of a broader framework of pushing the public and private sectors to work together to develop a broader digital payments ecosystem, in which mobile wallets have an important role to play, but are not the only show in town. Last year a new Financial Inclusion Law was passed by the country’s Congress, allowing for the establishment of a new type of regulated financial institution, an Organization Specialized in Electronic Deposits and Payments (or *SEPE, *its Spanish acronym). Maria José Uribe, head of strategy for financial inclusion and education within the Department of Social Prosperity told Mondato Insight that the goal of the new law was to see the development of more mobile money products in the years ahead that could cater to the needs of the vulnerable and financially excluded in Colombia. This pragmatic and practical approach is helping to ensure that mobile wallets have a broader utility than just the receipt of benefits, and potentially situates Colombia well for a breakthrough into mobile payments, if the right technology mix can be found.